Old news, but here is QVC’s press release Tuesday as celeb chef Emeril Lagasse coming back to QVC after a long stint on HSN. WEST CHESTER, Pa. (October 15, 2013) – Emeril Lagasse brings the spice of New Orleans to QVC with his high-quality kitchenware, food and cutlery products. The star chef, restaurateur, TV personality and best-selling cookbook author is scheduled to return to the multimedia retailer to showcase the collection on Wednesday, Oct. 16 beginning at midnight with shows throughout the day including 10 AM (ET), 1 PM (ET) and 5 PM (ET). Lagasse will heat things up at QVC with his collection during the “Emeril’s Kitchen” broadcast as he showcases the culinary vision which gained him worldwide fame. His line features an eclectic assortment of culinary tools that are perfect for home chefs, including cookware sets, a cast iron pizza pan, a master cutlery set and even a deep fryer. Designed to reflect Lagasse’s signature culinary expertise, each piece in the line embodies an innovative yet practical style that is created with professional-quality materials. Ranging from $20 to $100, the collection includes cookware by All-Clad, kitchen appliances by T-Fal, cutlery, cookbooks and more. HSN didn’t take long to find a younger replacement for celeb chef Emeril Lagasse. The home shopping network Wednesday said that Donatella Arpaia — “Iron Chef” judge, restaurateur, author and “culinary personality” — was doing a kitchen and culinary collection. It debuts Monday and will include stoneware, table linens and Italian food items. This news came a day after QVC announced the Lagasse, who has been on HSN for years, was coming comng over to the No. 1 home shopping channel. Named by Zagat as the “Hostess with the Mostess,” Donatella Arpaia has a reputation of fusing Italian tradition with modern, glamorous style. Her new collection brings added sparkle to the kitchen with a chic home pizza oven and luxurious rhinestone stoneware including platters, ceramic dishes and ramekins. Additionally, Donatella has taken the guess work out of traditional Italian cooking with her authentic Italian food offerings, featuring a variety of fresh pasta sauces, flavorful pizza crust mixes and her award-winning meatballs. With food preparation and presentation already made easy, the collection is completed with sets of cotton placemats and napkins on tear off rolls. Prices will range from $24.95 – $129.95 and will be available on HSN.com following Arpaia’s HSN appearance Monday. 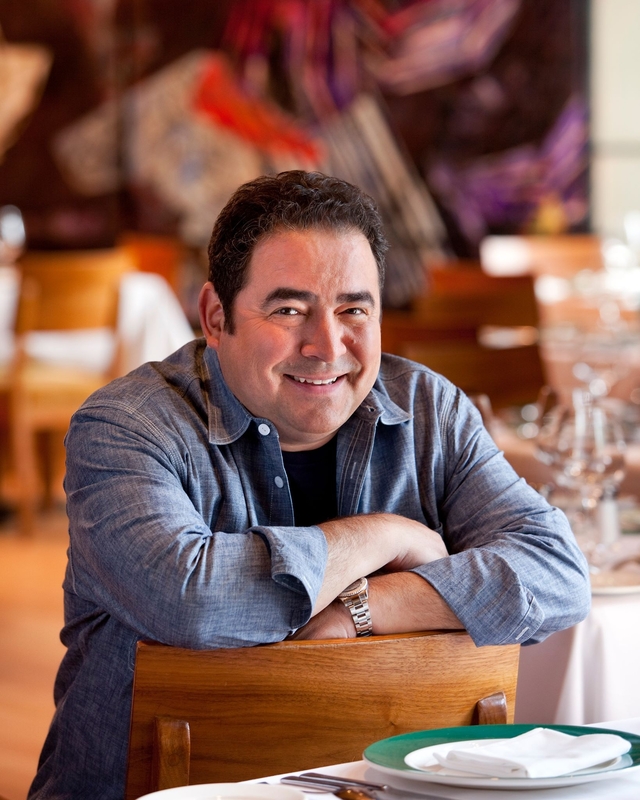 Celeb chef Emeril Lagasse has defected, from HSN to QVC!!!! The No. 1 home shopping network announced Wednesday that Lagasse “returning” to it. We don’t remember him ever being on QVC, just HSN, but there you go. The press release said that Lagasse will be showcasing his line of professional kitchenware, food and cutlery products. Lagasse, of Food Network and restaurant fame, will have a QVC collection that includes cookware sets, a cast iron pizza pan, a master cutlery set and a deep fryer. “Designed to reflect Lagasse’s signature culinary expertise, each piece in his line embodies an innovative yet practical style and includes cookware by All-Clad, kitchen appliances by T-Fal and more,” according to QVC. “No stranger to QVC,” the network said, Lagasse previously appeared on air in 2002 with a cookware set. More than a decade later, he’s scheduled to return Oct. 16 during the “Emeril’s Kitchen” broadcast with additional shows scheduled for December, January, February and well into the spring. This app will feature Big Easy chef Emeril Lagasse cooking and serving some of his favorite dishes. The new venue showcases an Emeril avatar and allows players to interact with virtual representations from Emeril’s top-selling Emerilware cookware and kitchen electrics line. Players can also instantly choose to purchase those very same Emerilware products directly from HSN’s e-commerce site, without leaving the app. When players enter Cooking Dash they immediately see the new “HSN Cooks with Emeril” venue. They can then enter the restaurant and begin to play. During gameplay, they will have access to a variety of Emeril products including a blender, mixer, deep fryer and chef’s knife. As players progress through the game, traditional Cooking Dash characters such as Flo are joined by virtual Emeril and together they cook and serve various recipes for the restaurant’s diners. Emeril’s products are then available in the DashMart, PlayFirst’s virtual store, as either virtual items or as an actual online order for delivery directly to your home. The Cooking Dash App, with the new “HSN Cooks with Emeril” restaurant venue, is available for $2.99 from the App Store on iPhone and iPod touch or at http://www.itunes.com/AppStore. This week HSN will launch a multi-platform event that celebrates the style, fashion and decor inspired by the summer film “The Help,” the home shopping network said Monday. “The Help” event will kick off starting Friday across all of HSN’s platforms, including television, HSN.com and HSN mobile. “The Help,” presented by DreamWorks Pictures and Reliance Entertainment, in association with Participant Media and Imagenation Abu Dhabi, is distributed by Touchstone Pictures and will be released nationwide Aug. 10. Based on one of the most talked about books in years and a No. 1 New York Times best-selling phenomenon, “The Help” stars Emma Stone (“Easy A”) as Skeeter, Academy Award—nominated Viola Davis (“Doubt”) as Aibileen and Octavia Spencer as Minny — three very different, extraordinary women in Mississippi during the 1960s, who build an unlikely friendship around a secret writing project that breaks societal rules and puts them all at risk. From their improbable alliance a remarkable sisterhood emerges, instilling all of them with the courage to transcend the lines that define them, and the realization that sometimes those lines are made to be crossed — even if it means bringing everyone in town face-to-face with the changing times. Deeply moving, filled with poignancy, humor and hope, “The Help” is a timeless and universal story about the ability to create change. CR by Cynthia Rowley — exclusive fashion and accessories. Lela Rose for HSN — 60’s style apparel with bold flowery prints and whimsical silhouettes. Chef Martha Hall Foose — chef and food stylist for “The Help” will debut her cookbook “A Southerly Course: Menus and Recipes from Close to Home” and present a variety of classic Southern foods ranging from boneless stuffed chicken breasts to red velvet cakes and brewed ice teas. Viking — known for their top-of-the-line major kitchen appliances, Viking will be showcasing their line of state-of-the-art hand-held appliances as part of the event. In addition, the event will showcase products from Carol’s Daughter and Stila; culinary and home offerings from Emeril Lagasse, Jeffery Banks, and The Lee Bros; and jewelry from R.J. Graziano. Mary J. Blige, a spokeswoman and investor in the Carol’s Daughter brand, will be expanding her fragrance collection with the launch of My Life Blossom, exclusively on HSN Aug. 13. The Grammy award-winning singer composed “The Living Proof, the theme song for “The Help” and will share personal anecdotes on working on the film when she appears on HSN. I cried the most when I saw all of the women gathered together. They chose to walk in love and forgiveness. My personal connection to the themes in the film is the fact that my Aunt Lara belle was a maid who worked for a very wealthy white family and they loved her to death and she ultimately raised their children. To be able to speak to so many women with this song means a lot to me. The events special features will include behind-the-scenes footage, videos, community boards and cast biographies, as well as an opportunity to buy an autographed copy of the book, can be found at http://www.hsn.com, keyword: the help. Jennifer Lopez’s appearance just marks the start of HSN’s “34 More Reasons to Celebrate” month-long birthday event. A private meet-and-greet for two with Mariah Carey in St. Petersburg, Fla.
A design consultation and $5,000 room makeover by Vern Yip, who launches his exclusive new line on HSN July 26. A trip for two to New Orleans, including dining at three Emeril Lagasse restaurants. A trip for two to New York City, including accommodations at The Plaza Hotel and dinner at Todd English’s Food Hall restaurant. Serena Williams will introduce exciting new additions to her exclusive Signature Statement collection on July 18. Martha Stewart premieres her craft paint collection on HSN on July 21. Tori Spelling returns with fashionably chic jewelry offerings on July 21. Mariah Carey will debut stylish new apparel exclusively on HSN on July 25. Jenny McCarthy makes her HSN debut with the Rescue Bullet blender to benefit Generation Rescue, her charitable organization that supports children with autism. Vern Yip will make his HSN debut on July 26 with the launch of an exclusive home collection. ImanN will appear on HSN July 28 and 30 with new pieces for her Global Chic collection. “More Mystery” Mondays will keep customers wondering what will happen next with surprise celebrity walk-ons, “mystery” products and exclusive surprise giveaways on Facebook. Customers that play instant-win games on hsn.com on Tuesdays will earn triple entries in the $150,000 “More to Celebrate Giveaway,” and winners will be revealed every hour on HSN. Wednesdays will feature a new 24-hour event each week, including special one-day-only values on customer favorites, including Beauty, Silver, Technibond and Christmas in July. Customers will enjoy extra spending power on every item that airs on HSN all day on “More Flex” Thursdays.